Sand, Wind and Stars - LRDG, 70 years on: On the Road. WELL DONE! Job 1 complete - so now I hope you all have a fantastic, safe and enjoyable trip. Bon voyage! Excellent. Glasses being raised here! well done, now time to forget the Alex hassles & enjoy the rest! I'll be following your progress. Enjoy your journey and be safe! Great stuff. 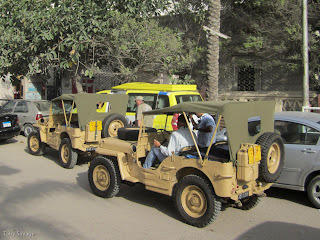 The jeepers look groovy touching tarmac in the African sunshine.